Micro-organisms which grow best in the presence of air and are inhibited in oxygen-free conditions. Some examples include Salmonella spp, Campylobacter, E.coli o157 and Bacillus cereus. Obligate aerobes can only grow in the presence of oxygen. Micro-organisms which grow best in the absence of oxygen and are inhibited in oxygen-rich conditions. As such, these micro-organisms are capable of growth in vacuum-packaged foods and foods packaged in a modified atmosphere. Some examples include Clostridium botulinum and Clostridium perfringens. Obligate anaerobes can only grow in the absence of oxygen. This is the symbol for “Water activity” which is a measurement of the water available in food to micro-organisms such as bacteria, yeasts and moulds. Micro-organisms require water to grow and as such it is possible to inhibit growth, and hence preserve foods, by reducing the amount of water available to spoilage micro-organisms. Similarly, the safety of food can be assured by reducing the available water below a level that will sustain pathogen growth. Water activity is measured on a scale of 0 to 1.0 with most bacteria capable of unrestricted growth at a aw 0.98 but being prevented from growth at a aw of 0.92. However, the ability to grow in a low water availability environment varies from one species to another. For example Staphylococcus aureus is able to grow at a aw of 0.86 whereas Clostridium botulinum requires a aw of 0.97 to grow. The most common ways to reduce the water activity of foods is by drying or by “binding” the available water, therefore preventing its use by micro-organisms, by adding sugar or salt to the food. In a HACCP study, it is often important to describe the food in terms of its aw so that the growth or inhibition of various micro-organisms can be properly assessed during the Hazard Analysis. A sequence of questions which can be applied to each process step with an identified hazard to identify which process steps are Critical Control Points (CCPs). 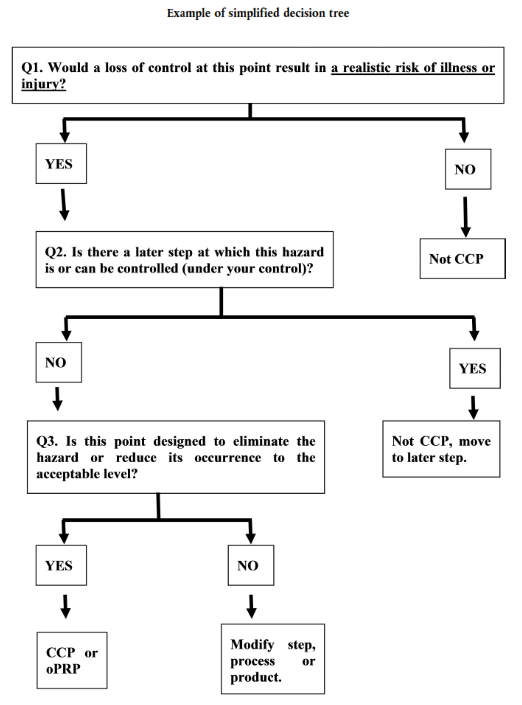 An example flow chart of a CCP (Critical Control Point) Decision Tree. The diagram displays labelled boxes connected by arrows indicating Yes or No answers to questions which can be applied to a step in a food production process. Start of decision tree. Question 1: Would a loss of control at this point result in a realistic risk of illness or injury? If yes go to list item 2. If no go to list item 3. Question 2: Is there a later step at which this hazard is or can be controlled (under your control)? If no go to list item 4. If yes go to list item 5. This point in the process is not a Critical Control Point (CCP). Decision tree ends. Question 3: Is this point designed to eliminate the hazard or reduce its occurrence to the acceptable level? If yes go to list item 6. If no go to list item 7. Not CCP, move to a later step. Decision tree ends. This point in the process is a CCP (Critical Control Point) or oPRP (Operational Pre-requisite Program). Decision tree ends. Modify the step, process or product. Decision tree ends. “Code for the production of microbiologically safe and stable emulsified and nonemulsified sauces containing acetic acid” is a means of determining the stability of a foodstuff such as sauces based on their acidic (acetic acid) content. The removal of physical particles such as soil and dirt using chemical and or physical means. The Commission, also known as CAC, is the central part of the Joint FAO/WHO Food Standards Programme and was established by FAO and WHO to protect consumer health and promote fair practices in food. The state wherein correct procedures are being followed and criteria are being met. To take all necessary actions to ensure and maintain compliance with criteria established in the HACCP Team. Any action and activity that can be used to prevent or eliminate a food safety hazard or reduce it to an acceptable level. Any action to be taken when the results of monitoring at a Critical Control Point indicates a loss of control. A step at which control can be applied and is essential to prevent or eliminate a food safety hazard or reduce it to an acceptable level. Most typical CCPs to control microbiological hazards are temperature requirements - for example, the temperature for storage or transport, the time/temperature conditions to reduce or eliminate a hazard (such as pasteurisation). Other CCPs may be checking that packages are clean and non-damaged, checking for physical hazards by sieving or metal detection or checking time/temperature of frying oil to avoid chemical process contaminants. A criterion which separates acceptability from unacceptability. Critical limits apply at Critical Control Points and could include the maximum or minimum temperatures required to eliminate a hazard and the time required to achieve this or could refer to the absence of contamination or damage. The “decimal reduction time”, the time required at a specified temperature to kill 90% of the micro-organisms in a given population. Failure to meet a critical limit. The removal or reduction of micro-organisms to acceptable (safe) levels. Bacteria which mostly grow in the presence of air (aerobes) but can adapt to grow, albeit slowly, in anaerobic conditions. An example of a facultative anaerobe is Listeria monocytogenes. The Food and Agriculture Organisation of the United Nations. The ultimate consumer of a foodstuff who will not use the food as part of any food business operation or activity. A systematic representation of the sequence of steps or operations used in the production or manufacture of a particular food item. An individual or company responsible for ensuring that the requirements of food law are met within the food business under their control. The combination of PRPs as preventive control measures; traceability, recall and communication as preparedness and HACCP plan defining CCPs and/or OPRPs as control measures linked to the production process. The FSMS is also the combination of control measures and assurance activities. The latter aims at providing evidence that control measures are working properly such as validation and verification, documentation and record keeping. Package of preventive practices and conditions to ensure the safety of the food produced. GHP underline more the need for hygiene, GMP stress correct work methodologies. Most PRPs (all those mentioned in Annex I of Regulation (EC) 852/2004)) are GHP or GMP. Sometimes no differentiation is made between GHP and GMP, calling all preventive measures ‘GMP’. A food safety management system that identifies, evaluates and controls hazards that are significant for food safety. A document, possibly electronic, fully describing the HACCP-based procedures. The initial HACCP plan shall be updated if there are changes in the production and must be supplemented with records from outcomes of monitoring and verification, and from corrective actions taken. The devotion of time and attention to acquiring the knowledge and information that is necessary to complete a HACCP plan using the MyHACCP tool. Depending on how complex your process is you may carry out more than one HACCP study. E.g. You may carry out one HACCP study for goods in, one for production (including all the products you produce) and one for despatch; this is referred to as a modular system. Alternatively you may complete one HACCP study for all products you make covering goods in through to despatch; this is referred to as a linear system. A group of suitably qualified and experienced personnel that are responsible for developing and maintaining a HACCP system. Optimally, this may be accomplished by assembling a multidisciplinary team. Where such expertise is not available on site, expert advice should be obtained from other sources, such as trade and industry associations, independent experts, regulatory authorities, HACCP literature and HACCP guidance (including sector-specific HACCP guides). It may be possible that a well-trained individual with access to such guidance is able to implement HACCP in-house without additional team members. A biological (e.g. Salmonella), chemical (e.g. dioxin, allergens) or physical (e.g. hard, sharp foreign bodies such as pieces of glass or metal) agent in food, or a condition of food, with the potential to cause an adverse health effect. The process of collecting and evaluating information on hazards and conditions leading to their presence, to decide which are significant for food safety and therefore should be addressed in the HACCP plan. Hazard analysis therefore involves the identification of significant hazards as well as suitable measures to control these hazards. The hurdle effect is of fundamental importance for the preservation of foods. Hurdles such as temperature, water activity, pH, salt content and redox potential can act in combination to prevent microbial growth and as such are significant for the microbial stability of foods. The intended use of a food should be based on the expected uses of the product by the end user or consumer. For example whether the food is “Ready to Eat”, “Processed” or ”Raw”. This refers to the replacement of air within a package with another gas or combination of gases, such as nitrogen and carbon dioxide. The effect of modifying the atmosphere in this way may create conditions for anaerobic bacteria, such as clostridium botulinum, to grow and produce toxins. An approach to HACCP where you group together process steps for a wide range of products. Each module will have a separate flow diagram and be covered by a HACCP study. The act of conducting in real time a planned sequence of observations or measurements of control parameters to assess whether a CCP is under control. This might include the regular (or continuous if automatic) measuring of the critical limits such as temperature and time at the identified critical control points of a food process. Biological toxins produced by moulds. Some examples include aflatoxins and ochratoxins, produced by Aspergillus spp; patulin produced by Penicillium spp and fumonisins and zearalenones produced by Fusarium spp. These are pre-requisite issues such as temperature control, disinfection or premises design which are essential at a Critical Control Point to prevent, eliminate or control a significant hazard to an acceptable level. Find out more about Operational Pre-requisite Programmes. A micro-organism that is capable of causing infection. A measurement of the acidity/alkalinity of a food. Most foods are in the acidic range, i.e. pH <7.0. Fresh beef, for example, may have a pH of 6.0 whereas orange juice may have a pH of 3.5. Preventive practices and conditions needed prior to and during the implementation of HACCP and which are essential for food safety. The PRPs needed depend on the segment of the food chain in which the sector operates and the type of sector. Examples of equivalent terms are Good Agriculture practice (GAP), Good Veterinarian Practice (GVP), Good Manufacturing Practice (GMP), Good Hygiene Practice (GHP), Good Production Practice (GPP), Good Distribution Practice (GDP) and Good Trading Practice (GTP). Sometimes, procedures to ensure traceability of food and recall in case of non-compliance are considered part of the PRPs. In Codex Alimentarius standards PRPs are referred to as ‘Codes of Good Practice’. See also “Operational Pre-requisite Programmes” (OPRPs). The holding of food or feed for the purpose of sale, including offering for sale or any other form of transfer, whether free of charge or not, and the sale, distribution, and other forms of transfer themselves. The production, rearing or growing of primary products such as fruit, vegetables, fish and eggs, including harvesting, milking and farmed animal production prior to slaughter. It also includes hunting and fishing and the harvesting of wild products. This category also includes convenience foods and microwave meals that require re-heating. Foods such as vegetables that are subjected to processes such as peeling and blanching are also included. A point, procedure, operation or stage in the food chain, including raw materials, from primary production to final consumption. A full description of the product should be drawn up, including relevant safety information such as: composition, physical/chemical structure (including Aw, pH, etc. ), microcidal/static treatments (heat-treatment, freezing, brining, smoking, etc. ), packaging, durability and storage conditions and method of distribution. Within businesses with multiple products, for example, catering operations, it may be effective to group products with similar characteristics or processing steps, for the purpose of development of the HACCP plan. A raw food is one which has not undergone any processing which would reduce the levels of micro-organisms but which would not be consumed in that state. Raw foods would normally be washed, cooked or treated in some other way prior to consumption to remove dangerous bacteria. Foods which have not undergone any processing but are consumed in that state are considered to be “ready to eat”. Raw foods will include red meat, poultry meat and raw fish, whether or not they have been diced, cut or filleted. It would also include root vegetables and shellfish that have not been processed and are not consumed raw. The redox potential, or more accurately the reduction potential, of a food refers to its tendency to acquire electrons and thereby to be reduced. Scheduled and initiated examination of the HACCP plan to ensure that it is kept up to date. A ready to eat food is one which is intended to be consumed without any further treatment or processing which would eliminate or reduce pathogens or their toxins to an acceptable level. Examples of ready to eat foods include: cooked, sliced meats; cheese; washed salads; sandwiches; coleslaw and dips. The fact that some consumers may choose to cook a food, for example, cheese on toast, does not change the status of the food as ready to eat. A process leading to the removal of all micro-organisms. A predetermined operational value for the control measure which has been shown to eliminate or control a hazard at a Critical Control Point (see also TOLERANCE below). The value between the target level and the critical limit. The ability to trace and follow a food, feed, food-producing animal or substance intended to be, or expected to be incorporated into a food or feed, through all stages of production, processing and distribution. Ultra-heat treatment or ultra-high temperature processing. A living bacterial cell that is capable of growth and reproduction. Obtaining evidence that a control measure or combination of control measures, if properly implemented, is capable of controlling the hazard to a specified outcome. Revalidation may be required in case of changes. Time/Temperature hazard reduction/elimination: follow up of relevant pathogens in heat-treated food products e.g. absence of Listeria, Salmonella etc. Damaged packages: testing for the most likely bacterial or chemical contamination a product might be exposed to if its package was damaged. A form of modified atmosphere packing where the air is removed from within a package leaving an anaerobic environment. The temperature change required to change the D value by a factor of 10. Describes a pathogen that can be transmitted from animals to humans. For example, Salmonella.